Literature holder tray for extending the COMBIBOXX A4 (product #8578), COMBIBOXX A4 SET L (product #8580) or COMBIBOXX PRO (product #8613). 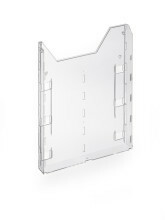 Aluminium floor stand with weighted, cast-iron base and crystal-clear acrylic brochure dispenser tray 315 x 223 mm. The tray has a 35 mm filling capacity and can be rotated from portrait to landscape format. Strong, sturdy floor stand supplied complete with 10 black PP display panels and index tabs. Each pocket displays 2 sheets of A4 paper. The floor stand has a cast iron base and a scratch resistant telescopic leg. 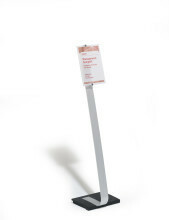 Table stands (floor stands) with display panel in high-quality acrylic. Ideal for use at trade fairs, exhibitions and in sales rooms. 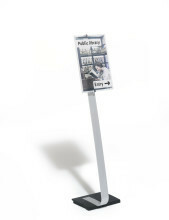 Floor stand for 10 A4 display panels, with cast iron base and telescopic leg. Adjustable reading angle and height. Extremely stable and has a scratchproof plastic coating.